July Cruise 2013 - Ilfracombe / Gower / Swansea / Weston. Uphill mooring to Ilfracombe, Gower, Swansea. 22nd - 28th July 2013. Two weeks working on engine fuel problem - not pulling full power, Result, rebuilt injector pump, my new injector spare fitted, new lift pump - fresh fuel, new filters and fuel hoses ! Somewhat out of pocket but revs seemed to be back before leaving. Leave Uphill mooring at 0700. Get halway down the Axe and the temp sensor fires off the warning buzzer - ( its loud as well ) Stop engine and drift alongside a moored boat. Maybe its opening too high a temp ? Engine also smoking a bit ! Start again and its off - so carry on. We initially decide to see how it goes - and if necessary go into Watchet. About and hour in and committed on the tide - it goes off again ! Still engine not really over hot - water pumping out ? We detach sender unit wire - other warning light still on ok ( oil etc ) - so carry on. Keeps going - sounds great, stops smoking - giving us good speed ? Decide to carry on to Ilfracoombe. Smooth sea - about 2-3 from the SW. Motor with main up and pulled in flat - Ian likes that set up and it seems to give an extra bit when heading into wind. 12.30 and we are off Foreland point. Hw Uphill was 0830 - so low was about 1400. Cut in close at LW to miss the main flood against us - but don't reach Rillage until15.30. Need to get out there into the main stream for maybe a mile and it can be 3 ks against you there if you are too far into the floodtide. We pick our line as close as we dare to the shore - checking speed. Make Ilfracombe harbour at 1600. Moor on outer visitors buoys. Re-attach temp sensor. I remove thermostat and check its opening - it is, but we don't have an accurate thermometer to check exact temp. I decide to fit a new impellor - but get a bolt head stuck on the pump body, running on the spanner - so have to really struggle to fit it in situ - which is a nightmare to do. 2am I get to bed. Forecast Southerly 3-4 - so decide to head over for Tenby. Leave around 9.30 - slight sea but no Southerly - more like a W - NW. Have to motor again - main pulled in tight. Leaving Ilfracombe for Tenby - glorious day. Nice out there mid channel - get five hours on the engine without any temp problem - then it goes again - so we take the wire off again. Keep an eye on the block temp and the wet exhaust flow. Dolphins buzzing the boat - about three, but more concerned with the engine. Maybe the were basking in the warmth of my exhaust ! 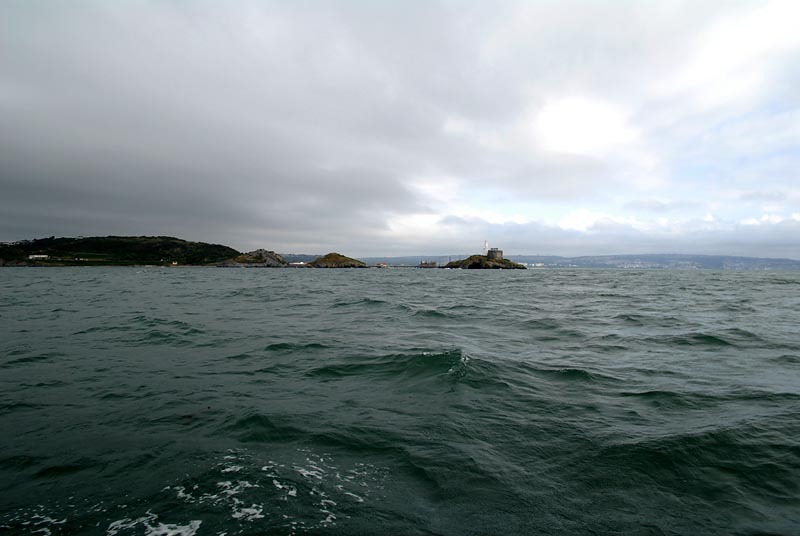 With the tide about to set east 7 miles S of West Helwick, we alter course for Oxwich Bay. Make there by 4pm. Seems fairly flat but the wind then does start backing S and picks up to a 6 overnight. Awful rolling night - so leave early 7.30 and go around to the Mumbles bay. By then its flat calm and light breeze - and a lovely morning. Anchor and have some breakfast. Then check out where we might dry her out and free up the log paddle. 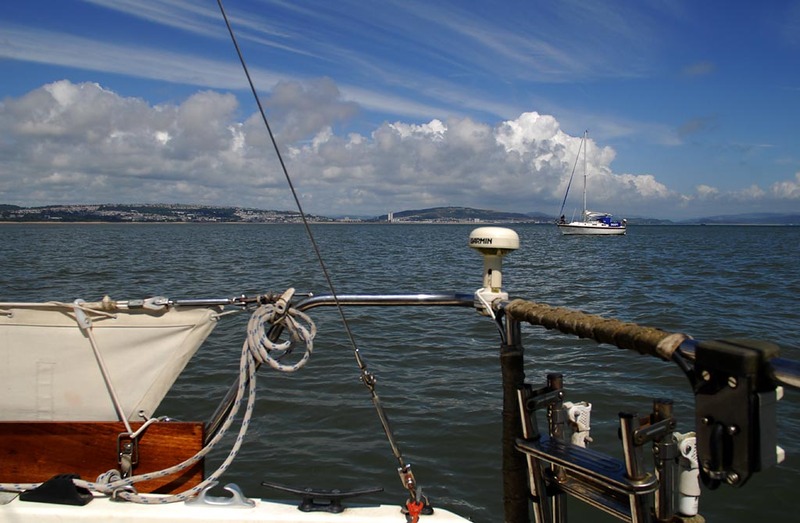 Spend the rest of the day sailing Swansea bay in a stiff warm breeze with little sea going - had her up to 5.8 kts close hauled. Prepare her for locking into Swansea marina around 6pm. Sailed back across and locked in. Meal in the eveming in Swansea boat club. Paddle is working and we have bat speed readings now again. 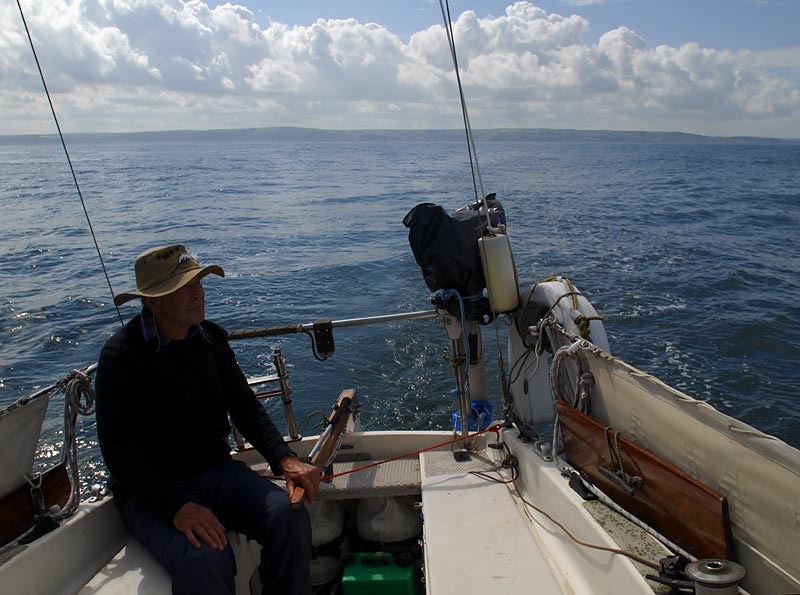 We were going to Barry - then anchor up round 10pm - to get away at the morning LW so as to get up to Uphill on Sun morning tide. 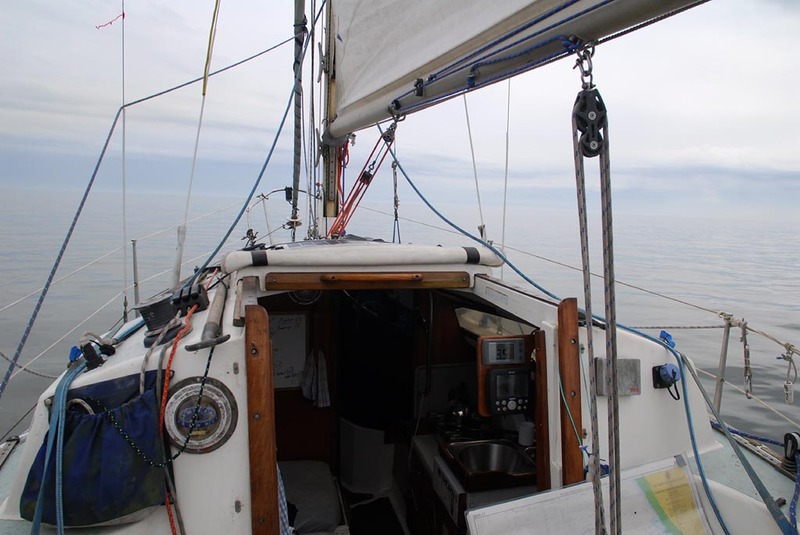 But with a forecast of 3 - 4 S, backing SW later - and Swansea Bay so slight we decided to take a look at the inshore route inside of Scarweather - and then Nash Passage. So we leave three hours before the flood east - just to see what we have against us. Set waypoints for Kenfig patches - then N of east Scar. Balmy flat calm through there - and never more than a half knot against - sometimes nothing at all. All very eerie and odd - seeing the breakers of the Scarweather bank so close. Nice passage and made Nash point for 1800 hrs. Running inside of Kefig patches - eerily calm. Strange bit of water in here ! So went direct for the evening tide at Uphill - 11pm. We figured on an 11.8 we can get up the Uphill pill around 9.45, then wait for water at the berth to get on. By now though its a worrying stiffening Easterly and heavy showers. Thankfully - it seemed some local sqall - so by Breaksea we had flat seas, a light E - SE 2-3 - motor seemed fine. Mostly making 6.6 - 7.6 kts across - just made Weston Bay by 9 - then more or less spot on our planned timing. This was just as well as wiith the cloudly overcast skies it darkened pretty quickly to a dismal gloom. By the time we entered Uphill pill it was really getting bad - and the last awkward bend into the pontoon area was grim - thenkfully I got a sight of the green bouy you have to 'swing around' at right angles nearly, to keep off the port bank shallows. Couldn't get on the berth - got a little stuck then freed up and pointed her into the berth on the mud with the engine in gear. A helping hand appered to take abow line - by this time it was 'dark, dark ! ' - we couldn't have left it any later. About15 mins and she ran in. We were home. Stayed aboard - and drove Ian home for about 8.30. He needed to get back a bit promptly for family issues. Nice trip - my fuel power problems sorted, but some mysterious overheating issue to look at this week. Maybe a combination - warm weather, lack of use, worn impellor ( the one I took out was a bit soft ) - in need of a new thermostat ( Yanmar say every 2000 hrs or 'when its been in the boat for a year' ! ) Maybe a dodgy temp sender ? Furred up pipwork at the hose unions. Anyway - I'm getting a new thermo, and have a good look at the rest.